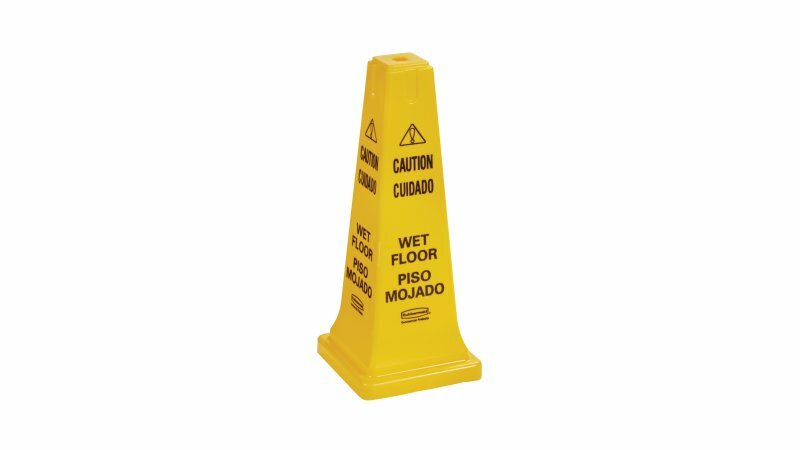 Safety Cone 25" "Caution Wet Floor"
The Rubbermaid Commercial Multi-Lingual Safety Cone with "Caution Wet Floor" Imprint is a highly visible hazard protection sign. Features the 'caution' sign to warn pedestrians of potential dangers. The Rubbermaid Commercial Safety Cone FG627777 is a highly visible, bright yellow hazard protection cone. 25.75" cone. Versatile top design accommodates barricade belt, flashing light, lock-in sign holder, and Audio Guard® accessories. Four-sided shape for efficient stacking. Multilingual imprinted warning message provides effective communication with broad audiences. Molded-in slots for easy handling. Can be used with Square BRUTE® Dolly (FG353000) for easy transport. ANSI- and OSHA-compliant color.